My parents’ garden comes up with great stuff every year. This season, they got butternut squash, and I took a cute little one for myself. 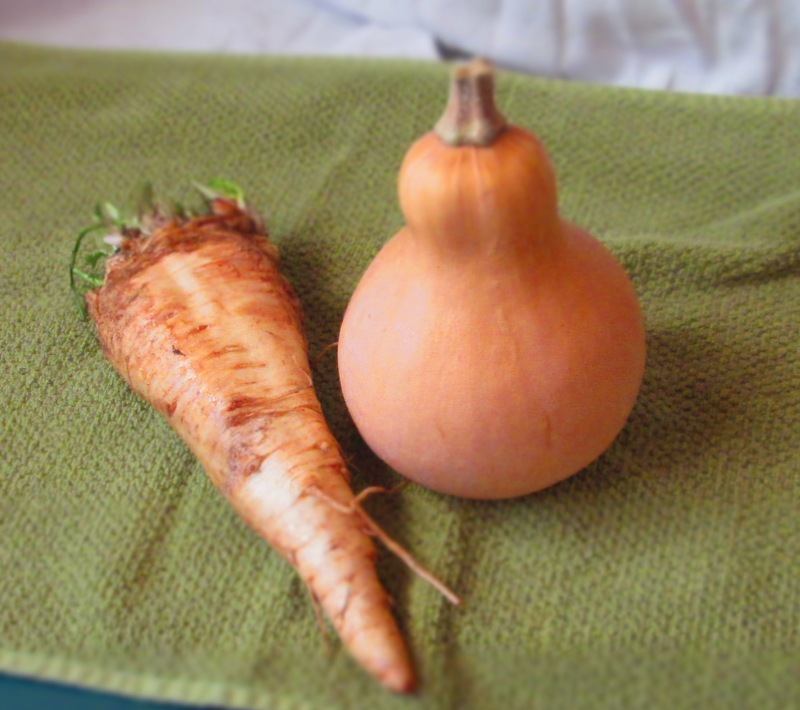 The farmers’ market had great-looking parsnips, so I decided to make parsnip-butternut soup. Because it’s October and I don’t have any fresh herbs left my garden, I turned to my dried herbs. 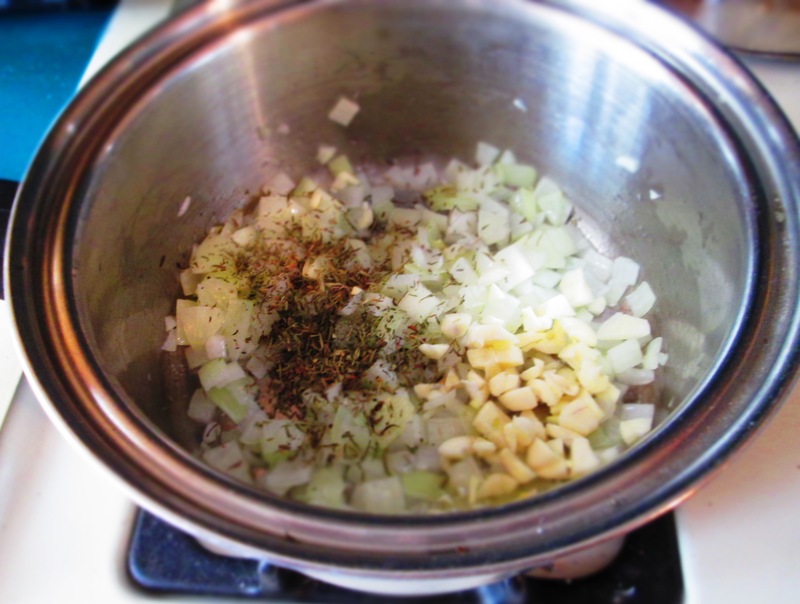 You can use whatever dried herbs you have on hand or particularly like for soup. I used thyme and savory. Also growing in my parents’ garden is celery. But it’s a kind of wild celery—in fact, it’s probably lovage, a relative of celery that has big leaves and small, thin stalks. 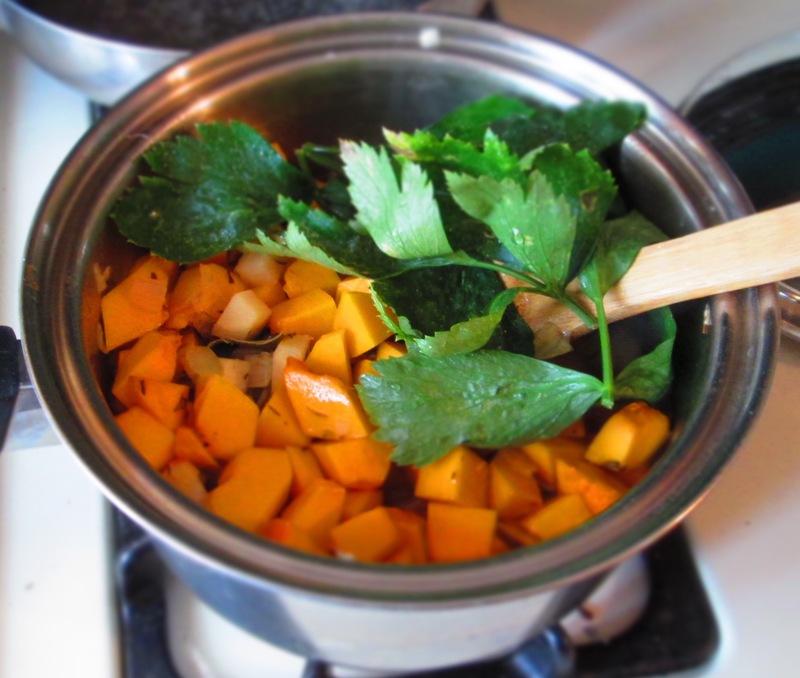 I put some of these leaves into the soup and pureed everything together. 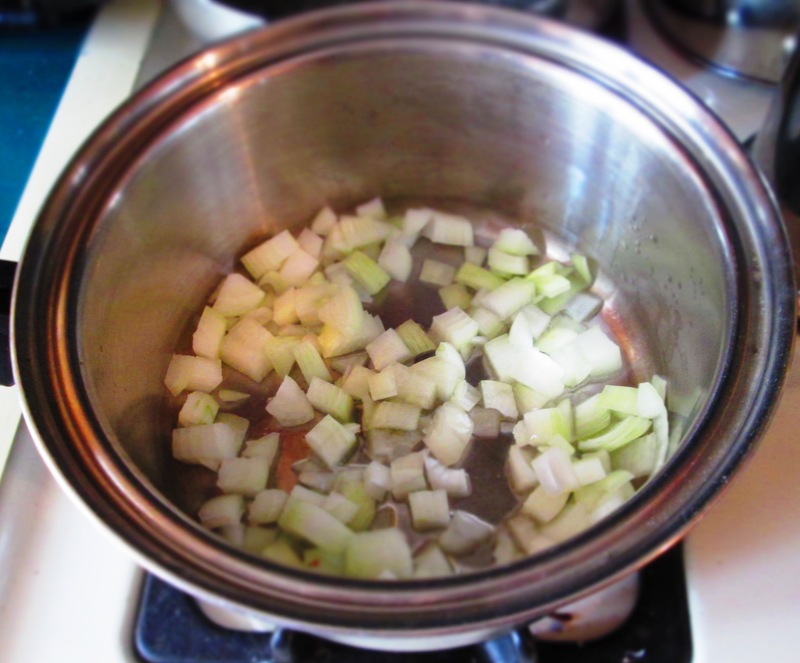 It unexpectedly turned my soup green, so it kind of looks like split-pea soup. If I hadn’t done that, I would have ended up with something that looks more like typical butternut squash soup. Regardless, it’s delicious. 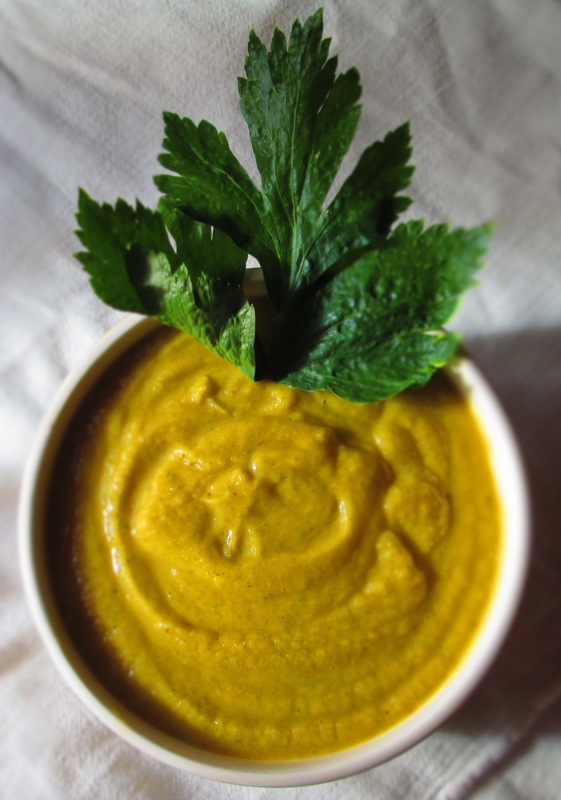 The parsnips give the soup an earthy tone, while the squash sweetens it up. It was just what I needed on a brisk autumn day. 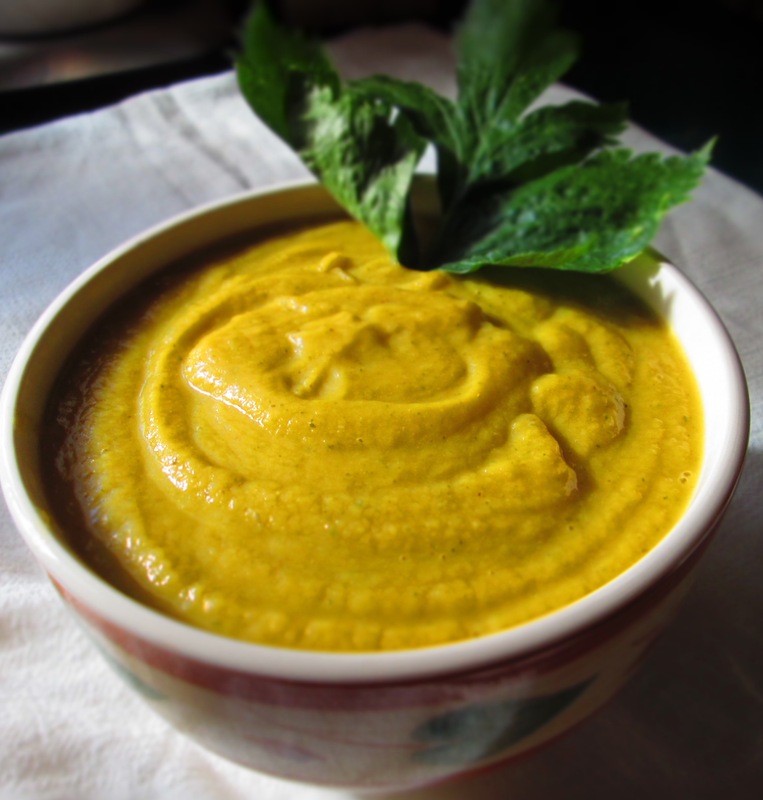 You can have it with croutons or chopped walnuts or little cooked cubes of butternut. Heat the olive oil in a medium saucepan. Add the onion and salt and cook until translucent. 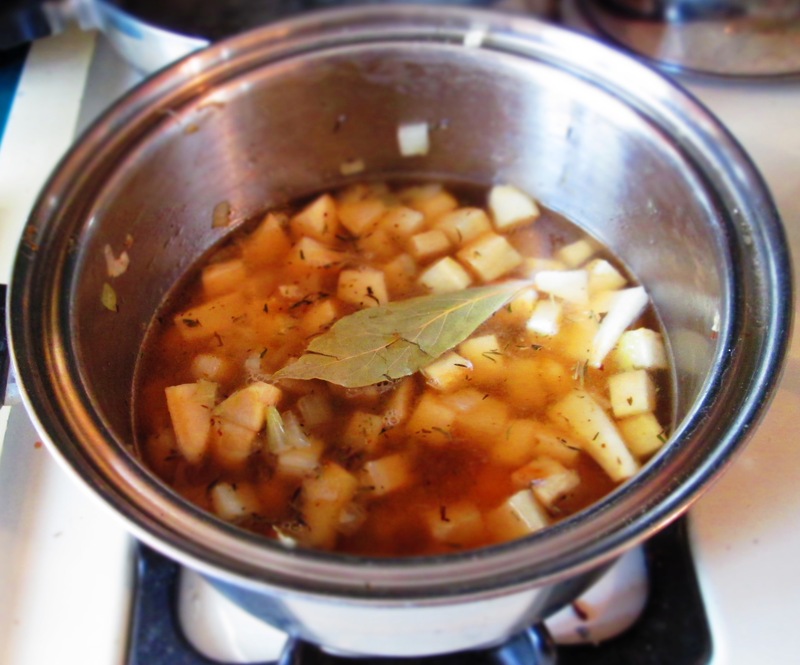 Add the garlic, bay leaf, dried spices (I used 1/2 teaspoon each thyme and savory), and garlic salt. Stir and continue cooking another 2 minutes. 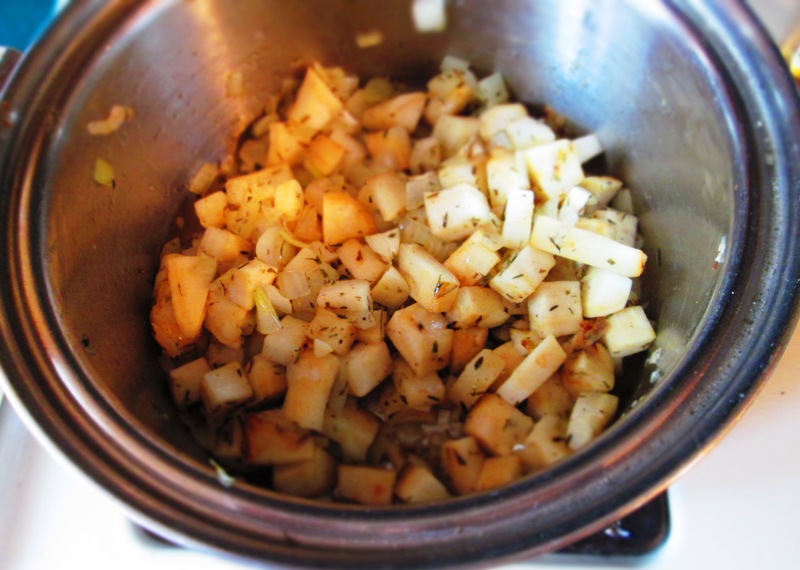 Add parsnips and saute, stirring often, until parsnips starts browning. Add broth. Bring to a boil. 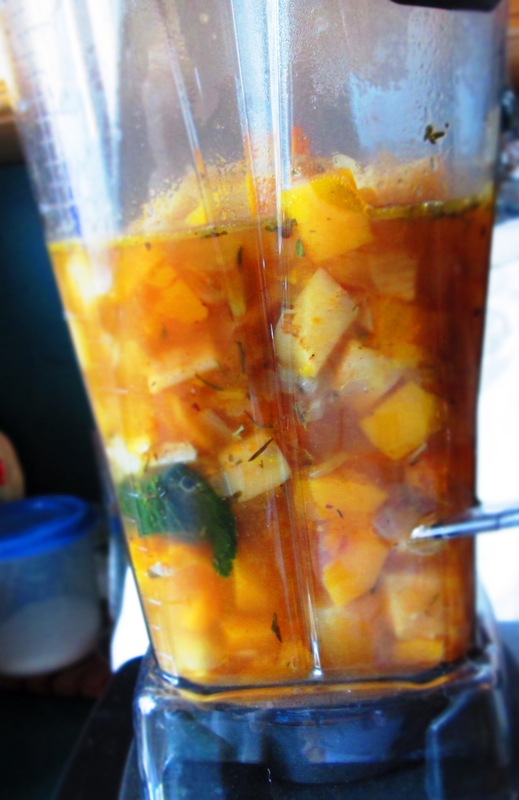 Add squash and any fresh herbs you want. 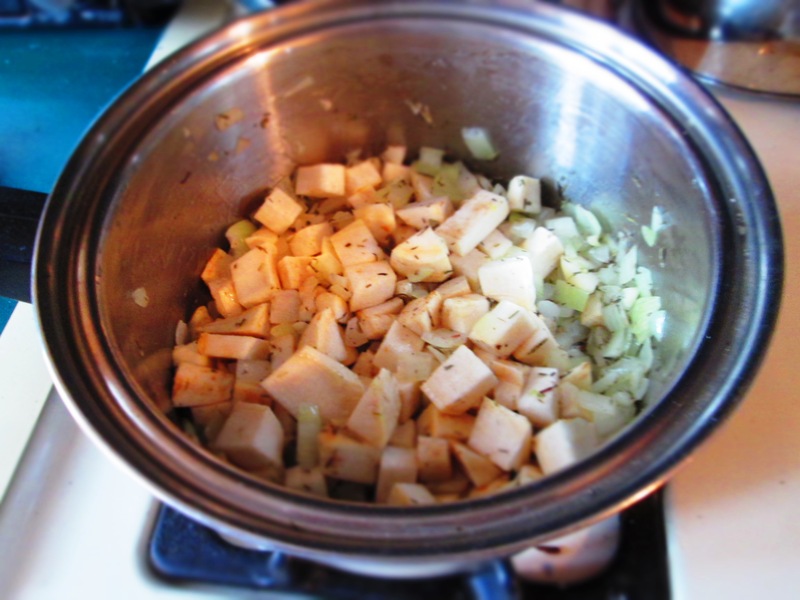 Lower the heat and simmer, partially covered, until the vegetables are tender when pierced with a knife. Add black pepper. 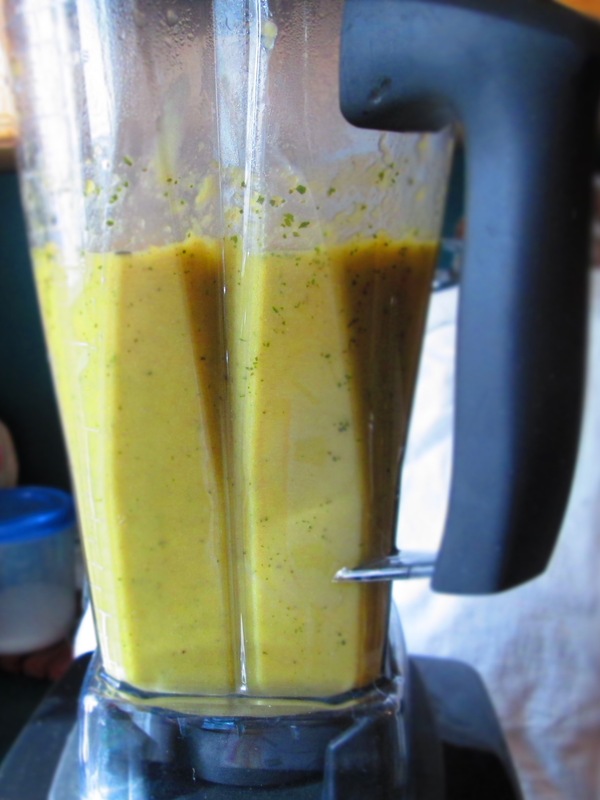 Transfer to a blender and puree. Taste for seasoning and adjust if needed. Serve hot. 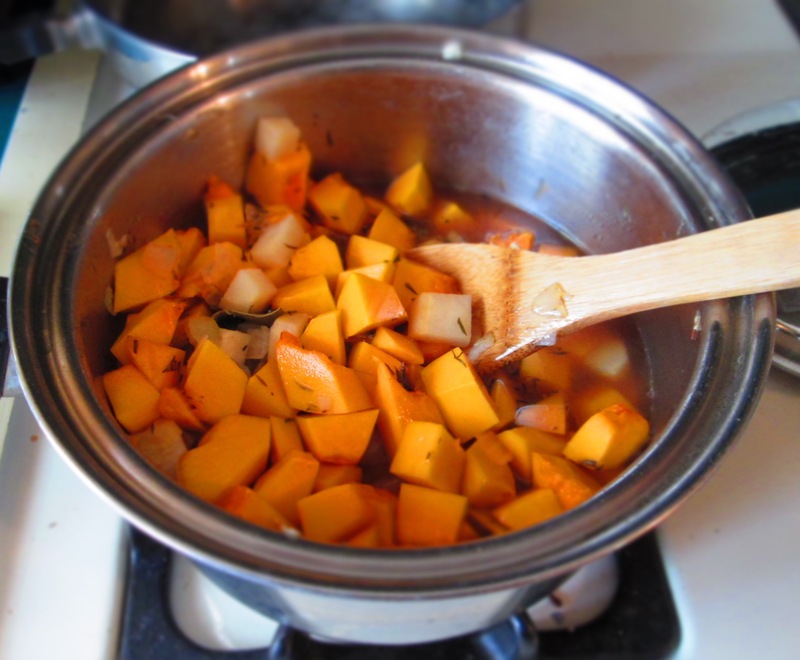 Categories: Gluten-free, Healthy eating, Recipes, Savory Cooking, seasonal cooking, Soup, Uncategorized, Vegan, Vegetables, Vegetarian | Tags: autumn, butternut, celery, healthy, lovage, parsnips, savory, soup | Permalink.